Forever Aloe Berry Nectar™ contains all of the goodness found in our Forever Aloe Vera Gel™, plus the added benefits of cranberry and apple. Besides their reputation as a cleanser for the urinary tract, cranberries provide a high content of vitamin C. They are also a natural source of healthful proanthocyanidins. Apple juice contains many flavonoids as well as pectin. 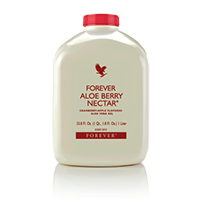 You can drink Forever Aloe Berry Nectar™ with meals or alone. The delicious flavor is totally natural, prepared from a blend of fresh cranberries and sweet, mellow apples. Added fructose (a natural fruit sugar) sweetens it just enough to please both adults and children alike.